Brining a turkey makes it moist and juicy. You can either brine it in a water solution with salt, water, sugar and spices or dry brine it. I suppose most of you know how to brine a turkey but for me this was the first time. I decided to try it this year and it is a fact that it produces a great tasting turkey which is tender and juicier. I am glad I decided to brine it this year as I do not know what would have happened to it with my old fridge breaking down. I read a few methods on the internet here and here and added a few ingredients of my own. Basically what you need is salt and water. Sugar is optional and the rest of the ingredients depend on what you like to add in the brine. The ratio of water to salt is 1 gallon (1 Gallon = 3.785 litres) to 1 cup of table salt. For a five kilo turkey you will need about 2 gallons of water. I always buy a fresh turkey so before brining it there is a lot of work to wash it and remove some roots of the feathers. I even use tweezers to remove the feathers as it is very difficult to remove them. After removing all the feathers there are some very tiny hair which are burnt off. You can use a frozen turkey if you prefer but it should be properly thawed, at least two days before brining, in the refrigerator. Before brining the turkey, I scorch it to remove any unwanted feathers or tiny hairs. I yet some cotton with alcohol which I light in the sink and pass the turkey over the flame for a few seconds until the feathers are burnt. The largest container I have is a large green bowl which I use in the kitchen and I use it only to clean and wash my greens (horta) and make dough. 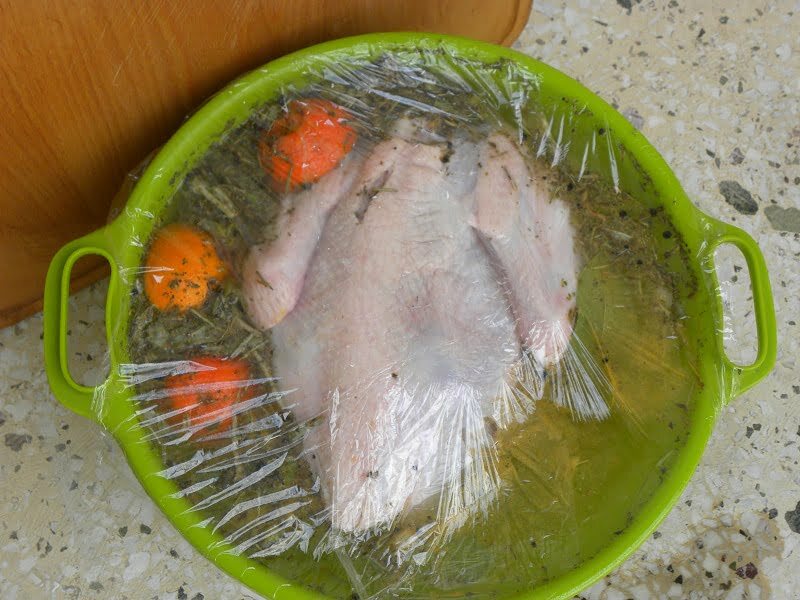 I put the turkey inside and measured the water needed. As you may see the turkey is not fully covered. I then removed the turkey and mixed in the ingredients until the salt and sugar dissolved. I then put the turkey in again, covered it with cling film and let it brine overnight for twelve hours and in the morning I turned it on the other side and let it brine for another twelve hours. As we live in an apartment in Athens, on the third floor, I leave the container outside on the balcony, which is safe as no animals or thieves can do any harm. After brining the turkey, it must be washed so that the salt and sugar is removed. I cooked the turkey the traditional way I make it every year and stuffed it with chicken giblets. You may find the recipe for my stuffed turkey here. The only addition this year was adding chestnuts instead of almonds to the filling. I added two cups of boiled and skinned chestnuts, which added an additional sweetness to the filling. I am definitely going to be making this every year from now on. After brining the turkey with the above method for ten years, this year I decided to try a dry brining method. I made the brine with Greek spices and other ingredients which are simple pantry staples. With a dry brine, you just mix the salt with garlic, honey and spices, lemon juice and mustard and rub it into the meat and cavity and you’re done. Cover it overnight and it’s ready to cook. Wash and scorch the turkey. Put all the brining ingredients in the container and mix. Add the turkey and cover with cling film. Next day turn it over for twelve more hours. Wash the turkey before cooking and season again. Put the salt in the mortar with the garlic and using the pestle, crush the garlic into a paste. Combine all the ingredients and mix them together. Rub the bird with the marinade, inside out. Previous Post: « An unexpected gift from Santa..
Beautiful picture of the cooked turkey Ivy! Well done and thanks for passing on those tips. Ivy, I’m glad you “took the plunge” and brined your turkey…it makes the turkey so much more moister. For next year, get one of those large plastic buckets you often find restaurants discarding as they can hold the entire turkey and water. PS. Even the leftovers are moist and juicy. That’s interesting! I bet the turkey was deliciously moist. Yummy flavors! Your turkey looks gorgeous! I have never brined but would like to try it and see what the difference is in taste and moistness. This looks great and I bet the citrus juices in it helped make it really tender. Ivy, I love, love, love brined turkey! I did it for the first time in one of my classes at culinary school and will never made a turkey another way again! It was the juiciest turkey I have ever had in my life, and like Peter said, even the leftovers were moist and juicy. It’s just too bad I have no control over the turkey at Thanksgiving time…. I’m waiting for the day when I can take over!